When you live a busy life, it can be hard to fit clean options into your daily routine. Sometimes you just need something easy and fast when you’re on the go. Sometimes you need something quick before your morning yoga class or something tasty to replenish your energy after a weekend jog. You want something easy that doesn’t require cutlery, napkins and several containers! Healthy smoothies are the perfect answer to this dilemma! When you know how to make them right, they can be packed full of powerful nutrients coming from fruits, veggies, lean proteins and healthy fats! Smoothies are a great source of high-quality liquid nutrition that gives you what you want to fuel your busy lifestyle. Use this infographic to help you engineer the perfect tasty, portable smoothie! You can even print it out and stick it on your fridge for a reminder to stick to your healthy eating goals! Not all these steps are mandatory – the best thing about smoothies is the endless combinations! Find out what you like best and have fun creating your very own smoothie masterpiece! 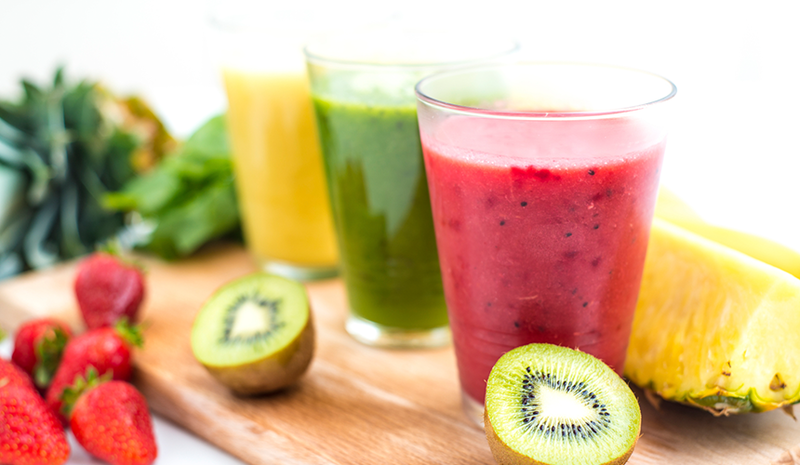 Here are a few amazing of examples of smoothie recipes that we love!